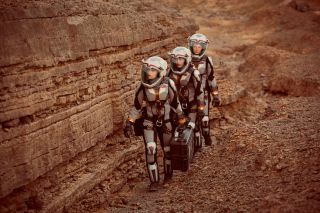 Anamaria Marinca as Marta Kamen the Russian exobiologist and geologist, JiHAE as Hana Seung the Korean-American mission pilot and software engineer and Cosmia Shaw as Leslie Richardson the British nuclear physicist and leader of MMC’s Phase 2 team in National Geographic's "Mars" mini-series. Like most of the technology featured in National Geographic's "Mars" miniseries, the futuristic spacesuits worn by the Mars colonists are based on realistic ideas conjured up by scientists and engineers today. "Mars" tells a fictional story about the first humans to land on the Red Planet in the year 2033. Though we have yet to send people to Mars, researchers at NASA and other institutions have been working on concepts for Mars spacesuits for more than a decade. Ciancio told Space.com that her main inspiration was the Biosuit, a skintight spacesuit designed by researchers at MIT. Biosuits are pressurized like existing spacesuit designs, but they aren't as big and bulky. For traditional spacesuit designs to be pressurized, they are filled with air, like a human-shaped balloon. But the Biosuit achieves that same pressurization without the added air by applying pressure directly to the skin with a tightly fitted jumpsuit. Ciancio spent time researching spacesuit designs by NASA and SpaceX in addition to the Biosuit to get as much insight as possible into the best ways to dress an astronaut. "Of course, everything is based on reality," she said. "It must be credible." The form-fitting Biosuit spacesuit concept developed by MIT engineers is seen on display at the Beyond Earth exhibition at the American Museum of Natural History in New York City. The skintight spacesuits Ciancio designed for "Mars" had to be custom-made for every individual actor. Wiggle room is not an option for spacesuits that are pressurized by skin-to-suit contact. To achieve that necessary skintight appearance, Ciancio made the suits out of a rubbery material called neoprene, which is also used in drysuits for divers on Earth. Neoprene is lightweight, strong and comfortable — and it provides thermal insulation, making it ideal for hard-working astronauts on Mars, which is much colder than Earth. Ciancio said she liked working with neoprene because it "underlines the shape of the human muscles." In National Geographic's "Mars" series, the astronauts' spacesuits are equipped with bright headlights. This comes in handy not just at nighttime, but also for exploring Mars' dark underground caves. Pictured here is Russian exobiologist and geologist Anamaria Marinca, played by Marta Kamen. Ciancio also designed the astronauts' helmets, which needed to be practical for filming while still looking as realistic as possible. This was a bit of a technological challenge, Ciancio said. Each helmet contains headlights, a microphone and speakers to allow the actors to easily communicate on the set, and even a small fan to cool them down. A built-in battery pack powers all of the devices inside the helmet. Several scenes of "Mars" were filmed in Morocco under a hot sun, so the helmet fans were crucial for keeping the actors from overheating. To give her designs a more realistic appearance, Ciancio connected the helmet and backpack with a tube. An oxygen tank inside the backpack would allow the Mars explorers to breathe, because the air on Mars is far from breathable. Of all the aspects of the suit that required technological innovation, Ciancio said the biggest design challenge was creating gloves that connect to the suit and could be taken off and put back on without compromising the air-tight seal. Because Ciancio didn't have the scientific background needed to make a real Mars spacesuit, she sent her designs to the scientific consultants who worked on the "Mars" series. But with all the research she did before creating the suits, getting the necessary approval from the scientists was a piece of cake. To see Ciancio's spacesuit design in action, catch the grand finale of "Mars" Monday (Dec. 19) at 9 p.m. EST on the National Geographic Channel. For more information about the series and the prospect of a future Mars colony, check out National Geographic's multimedia website for the International Mars Science Foundation.